We have a new routine at our house, largely due to the ice our yard has been plagued with for the past month or so. We are going for leash walks around our neighborhood. What? Sounds so basic an obvious, and it kind of is, but not really. How is that for avoidance of being decisive? You see we gave up walking our dogs in our neighborhood about 5-6years ago, maybe even a bit further back, and to be quite frank we should have stopped ten years ago. I was trying to be optimistic and it unfortunately was at my dogs expense. Franny was bit hard on three separate walks, lots of blood from her face, and back legs. After that spring she would then start to prepare herself when leaving the house, as if she was going into battle, and it became difficult to keep her breathing and calm because she knew another dog was coming to get her. We spent years walking her up at MSU and other locations to restore her trust in us being her guardians. The neighborhood was her hot zone, and not a good relaxed place to be for her. Story was pummeled from a dog charging out of his yard, thank god he can take the fire out of most dogs, not all but most. $eeker was snarked at so hard he decided he wouldn’t leave our front porch. All of these incidences were sans human. Yes you’ve got it, dogs on their own while their owners were either busy in their house, yard and even gone for the day at work. My Ocean has only had one bad experience with a dog charging her while we were out for a night walk, she no longer likes walking at night when there is wind and shadows. They do have friends in the neighborhood, a Golden cross, a Malamute, two labs, and a Something pure breed cross. Resuming our walks has been really fun for all of us. I get the older girls, one because I want to, and two because my knees are shot for any type of running on a hard surface, we seem to be well suited for each other in this stage of life. I take each one separately for a one to two mile walk. We just putter along, lots of smells, friends to visit through the fence, and some good fresh air. They love their Freedom harness, I love walking out my front door with them and getting to spend this time out and about. My husband takes the Frat Boyz! He’ll take them together or separately, and they go for a 3-5 mile run. Story and $eeker are all business when out on a run. They have been coming home so happy and satiated, and it helps that Spore runs 10k’s and half marathons, it works for all of them. So what’s changed? Nothing apparently. While the offending owners and dogs have all changed names, breeds and houses, the dynamic is the same. Slightly disappointing on all levels. But what has changed is how I deal with it. When I am out with my dogs, I am out to spend time with my dogs, not get into a conflict or have to wrangle someone else’s dog. I choose the path of least resistance. If we are walking down a sidewalk and there is a dog or dog with person coming our way we simply cross the street without conflict. If a dog is in a yard unattended we simply cross the street. If there is a dog off leash coming at us and I don’t see a human close by, I simply pick my old girl up and then cross the street that way. I have only had one person try to start to tell me their dog was friendly, but as soon as she saw who I was, and she knew me, she made a significant effort to get her dog on a leash and then she crossed the street. And frankly, as all of my clients know, that line is so old, so over used, and so well rehearsed that as soon as it comes out of someones mouth it clarifies ignorance and a lack of respect for those around them. I have very little tolerance for that specific word phrase in the dog world. There is simply way to much information out there, and enough signage in regards to leash laws, almost to the point of pollution really, that there is no excuse. 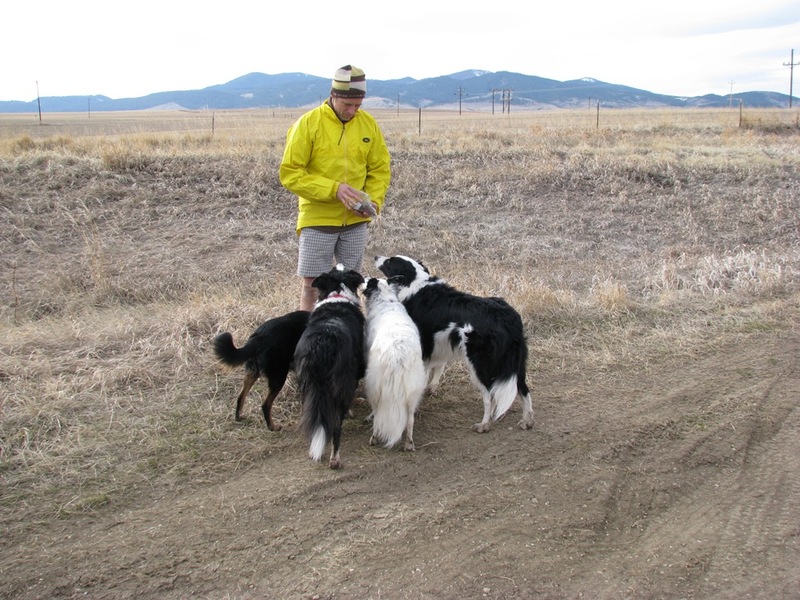 Spore and the Frat Boyz have had no problems as of yet, but Spore also has legs up to his chin and runs at a fairly good clip, much to the Border Collies liking. I wish them continued Zero Conflict Runs. I choose my walks based on location and time of day. I want to walk, relax, enjoy my old girls, and come home happy and smiling. That to me is what a walk is all about. I now carry a cell phone and will not hesitate to call animal control should I feel threatened in anyway. I really disdain getting into verbal confrontations when out and about, it takes my time away from my dogs, I will let someone else do it, someone who is paid to do it. And when someone didn’t care enough to keep their dog with them, a monetary fine seems to be a helpful reminder. So here is my wish for all of you. May you all have Zero Conflict Walks. Enjoy being out with your dog, that time is oh so precious, and even more so when you realize how little time we really have with them. Be respectful to those around you and follow the leash laws. Respect others space, and take the path of least resistance. Here is to Zero Conflict Walks, spread the word, due the right thing.